Amanda M. Naaum, Robert Hanner, Steven Newmaster and the team at TRU-ID have been fighting to provide consumer confidence in the authenticity of food and natural health products for years. Established in 2013, TRU-ID is the world’s 1st certification program founded on cutting edge DNA biotechnology, in support of businesses who seek authentic ingredients. 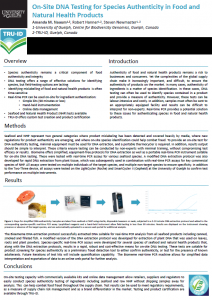 In July, they presented a poster entitled “On-Site DNA Testing for Species Authenticity in Food and Natural Health Products” at the 2017 qPCR & Digital PCR Congress held in Philadephia, PA. As you can tell from the poster’s title, their latest tool in the fight for food integrity is onsite testing enabled by Biomeme. Food fraud and its result, counterfeit food, is a major problem. Not only does it present a health risk to misled consumers, it also comes with a steep economic cost for businesses. In 2013 the New York Times reported that “economic adulteration and counterfeiting of global food and consumer products was expected to cost the [grocery] industry $10 billion to $15 billion a year.” Through its poster presentation, TRU-ID has demonstrated that Biomeme’s platform can be used to combat food fraud, and fight for food integrity. Ultimately, the combination of TRU-ID’s assays with Biomeme’s platform resulted in, “…a rapid, robust and cost-effective means for on-site DNA testing.” To learn more, or to see the full findings, please see the PDF of the poster. Have an application for this technology? Please contact us.